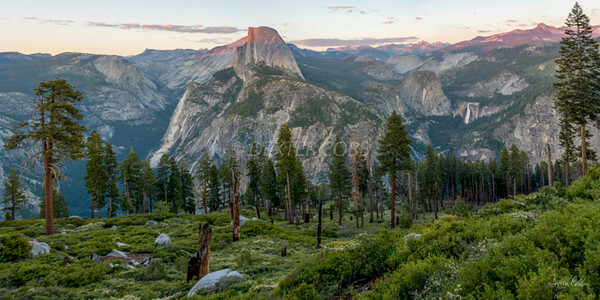 Here is a view that certainly lends itself well to a panoramic image: From the blooming foreground, to the conifers at mid-scene, to the grand iconic image of half-dome and the high sierra in the distance, a pano is needed to convey the shear breath and majesty of this view. There were good clouds over Yosemite when I left Fresno 3 hours prior, and clear skies to the west way out over the Pacific, with clouds expected to remain over Yosemite with 20% chance of rain during the early evening. Well, that didn’t happen. Thankfully, this guy Dave, A young Jedi from Australia, was standing in my spot since I was forced to look at the scene from a different perspective. It turns out that Dave was making the rounds: He started out photographing Joshua Tree, then he came here to Yosemite and next he will head on to Lake Tahoe and then home. We had a good visit while we waited for the light to moderate although he did have to repeat himself and elaborate often with his thick accent and my tin ear. Did you know that Aussies call eucalyptus trees gum trees?